I seem to have an unstable neighbor. She was somewhat normal until she had her kid, now it's a 180 degree turn. Yesterday she felt the need to throw eggs at our 12 year old dog with arthritis. I heard our dog whimpering and found eggs in our backyard. Needless to say I wasn't happy. She has also forgotten to pick up her kid at the bus stop multiple times forcing me to walk him home so he doesn't get hit by a car. I feel bad for her since I think she might have post partum depression that isn't treated. However, I also am beginning to lose my patience with the entire situation. At the bus stop in the morning she allows her kid to stand in the street and push my children, while I calmly try to explain to my own kids that there is a difference between raising your kids to survive to adulthood and raising your kids to be successful members of society. I miss the 80's when I was growing up. If I acted up at the bus stop my mother would have gotten phone calls from all our neighbors and I would have been grounded or had my tv privileges taken away by the time I got home. Apparently modern parenting isn't something that I do so well with. One thing that I have learned to do well is to make biscuits. Growing up my mother never made biscuits, we ate them at restaurants, but even those were few and far between. When I moved to WV it was a whole different story. There is a whole breakfast chain that just serves biscuits (and a few other items). Over the years I have learned that there is a right and wrong way to treat your biscuit dough. 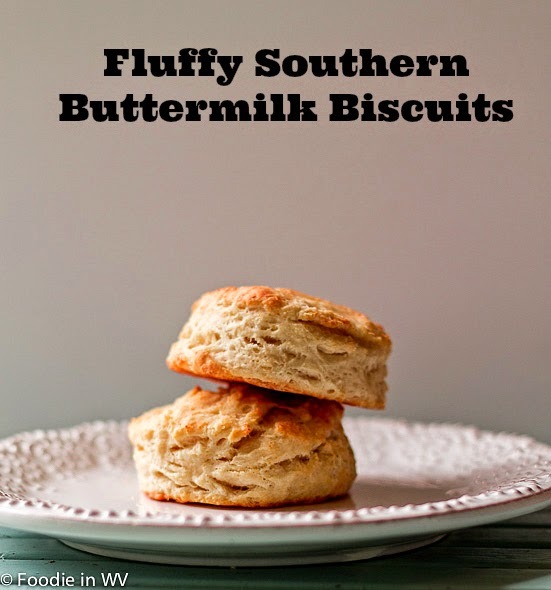 The following is a recipe for Fluffy Southern Buttermilk Biscuits. Cutting the butter into small pieces add it to the flour mixture. I use a small knife and cut off chunks above the bowl and then add the chunks using either a fork or your hands. Add buttermilk to the mixture and stir just until the dough comes together, any longer and it will be tough. Pat the dough into a circle approximately a 1/2 inch thick. Using a 2 inch biscuits cutter cut out the biscuits. Make sure not to twist the cutter in order to get the biscuits out, it will lead to tough biscuits. Place the biscuits a couple of inches apart on a parchment lined baking sheet. Bake for 10-12 minutes in a preheated 450 degree oven. man, who doesn't love biscuits?! my mom never made them either, but we all love to eat them. 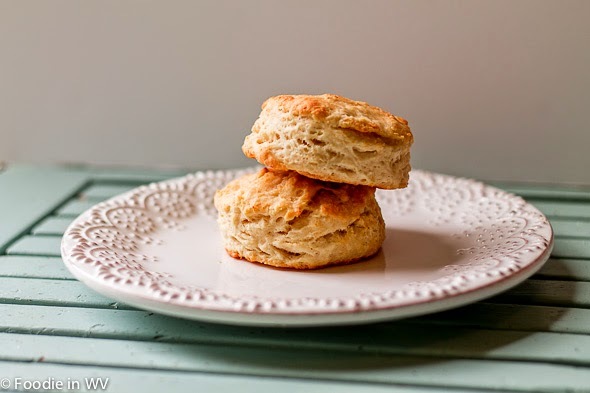 it's been on my list to find a good biscuit (and scone) recipe to make and perfect. this recipe isn't too intimidating! thank you for sharing it. Scones are the other baked good that my family loves :) They are actually very easy to make! This recipe is easy also, as long as you don't overly knead the dough they come out delicious! Oh jeez - nice neighbor you have there. The poor kid. If you see what you do, imagine what actually goes on inside the house. That might just come in handy! Thanks! The recipe is very easy and great for breakfast or a dinner side! Love the layers! These biscuits look perfect, Ann. Great shot as always, Ann.. Love buscuits and yours look yum! Happy weekend! You're sweet, thanks :) Happy belated weekend to you too! OK Ann I would seriously have a chat with that woman. Your kids aren't safe with that kid around at the bus stop and she needs to be aware that her child is causing trouble and won't be tolerated. Neither is her own behavior. As for those biscuits they look absolutely scrumptious. I just love biscuits but have never made my own. I did talk to her and everything is mostly resolved. The kids have been much better at the bus recently. As for the biscuits, they are really easy and worth making from scratch! Homemade biscuits make me sing (and believe me, I can't carry a tune!). I'm sorry about your neighbor. I like your new profile pic!